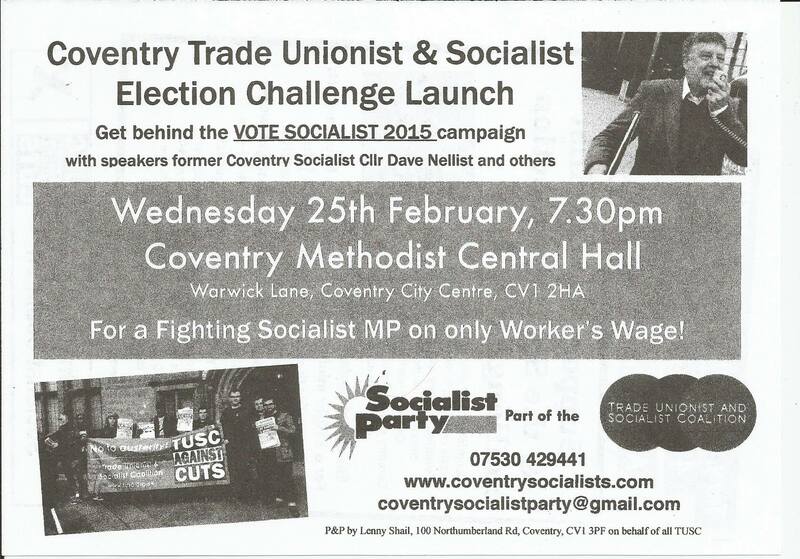 Two dates for your diary – major protest against the cuts and TUSC election launch! Anti austerity campaigners in Coventry are working hard to build for two key events taking place in the city next month. See the bottom of this article for details of both. The first is a major demonstration called by Coventry TUC, Coventry against the Cuts and local trade unions against the proposed cuts by Coventry City Council which will see the closure of vital local services such as community centres, local libraries and children’s centres. This takes place on the Saturday before Councillors vote on the cuts budget – we need to show our opposition. Make sure you are there and bring as many people as possible with you! Shortly after this demonstration the Socialist Party and the Trade Unionist and Socialist Coalition will be holding the launch event for our election campaign. Speakers will include Dave Nellist, local trade unionists and campaigners. TUSC will be the only socialist and anti-austerity alternative in these elections – come to our launch to find out how you can get involved.